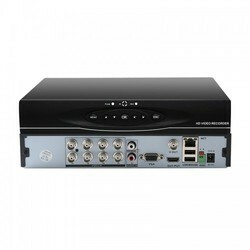 Pioneers in the industry, we offer 8 channel dvr and 16 channel dvr from India. Assisted by our vast industrial understanding in this field, we are enthusiastic towards offering optimal quality 8 Channel DVR. The offered product is designed using elevated-grade material and cutting-edge technology. We offer this product in numerous sizes, shapes and designs as per the patron’s necessities. In addition to this, we offer these in standard as well as modified forms. 8 Channel DVR, 200 FPS Real Time Recording, H.264 Compression, PAL/NTSC adaptive video inputs. Manual/Motion/ Timer/ Alarm Recording, USB Backup, 10/100M adaptive network interface. PTZ control (PELCO protocol), Pre alarm recording, with up to 2TB storage capacity, Remote Access With Users Permission, Remote manual recording. 16 Channel DVR, 400 FPS Real Time Recording, H.264 Compression, PAL/NTSC adaptive video inputs. Manual/Motion/ Timer/ Alarm Recording, USB Backup, 10/100M adaptive network interface. PTZ control (PELCO protocol), Pre alarm recording, with up to 4TB storage capacity, Remote Access With Users Permission, Remote manual recording.